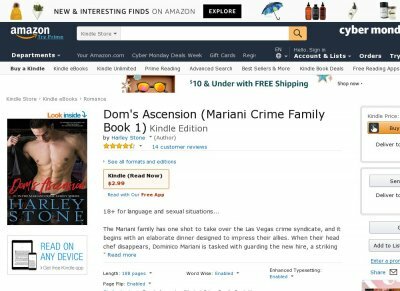 The Mariani family has one shot to take over the Las Vegas crime syndicate, and it begins with an elaborate dinner designed to impress their allies. When their head chef disappears, Dominico Mariani is tasked with guarding the new hire, a striking spitfire with a tendency to speak her mind. Annetta Porro is thrilled to land her dream job at a five-star Italian restaurant, even if her new boss seems overly concerned about her safety. With a chivalrous, handsome bodyguard by her side, she may keep her life only to lose her heart. His decision could destroy an alliance, but her sacrifice will shape the future of a city.